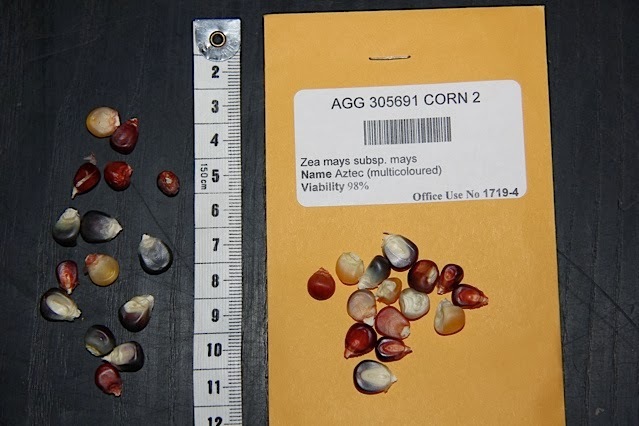 There are fewer and fewer varieties of corn available in Australia. This is concerning as it is no longer possible to import corn seed for the purposes of growing (although supermarkets do import popcorn for eating, most of which is contaminated with GM corn). Many of the varieties that I grew when I was a teenager are no longer around in Australia. Some are no great loss while others will be sorely missed. 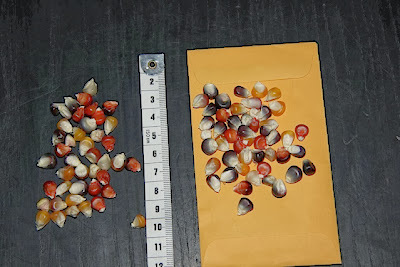 Many people who sell corn seeds on Ebay or similar places sell such small numbers of seed that you can not get a crop. 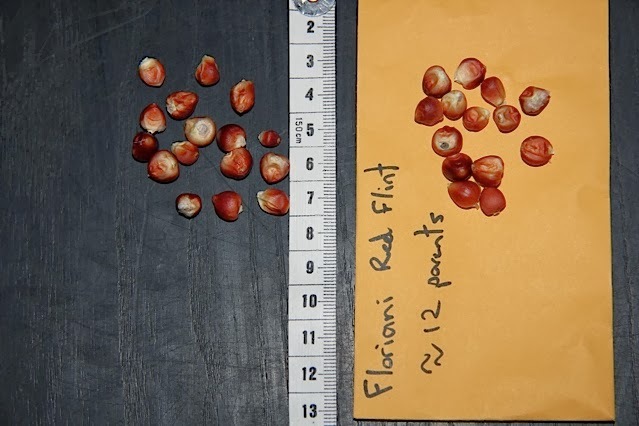 Even if you are lucky enough to get a crop their stock is often suffering from severe inbreeding depression because they do not know what they are doing when saving seed so it is nearly impossible to recover the variety. Many also sell unknown crosses of corn because they do not know what they are doing when it comes to saving seeds. 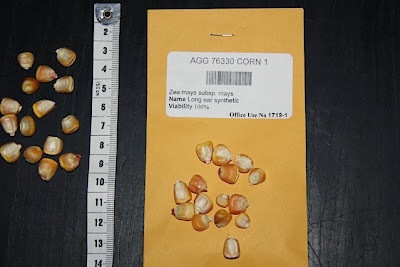 When people are out to make easy money like this they also tend not to select for any desirable traits, so popcorn stops popping, long cob forms have regular sized cobs, coloured corn loses its vibrancy and so on. This makes the heirloom corn situation in Australia rather dire. It is not all doom and gloom though. 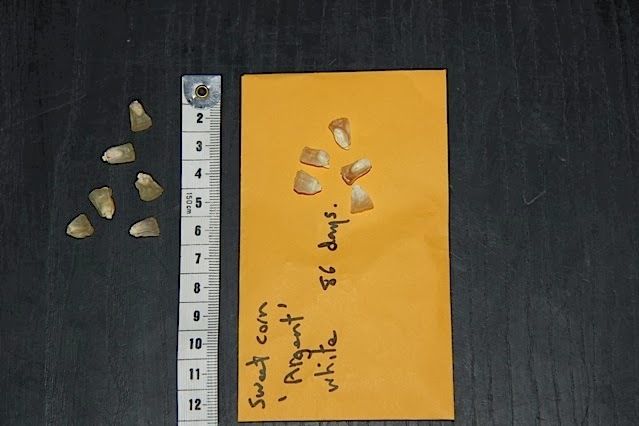 I know a few people who grow corn and attempt to keep their strains pure as well as avoiding inbreeding depression while selecting for desirable traits. Others are developing new varieties. 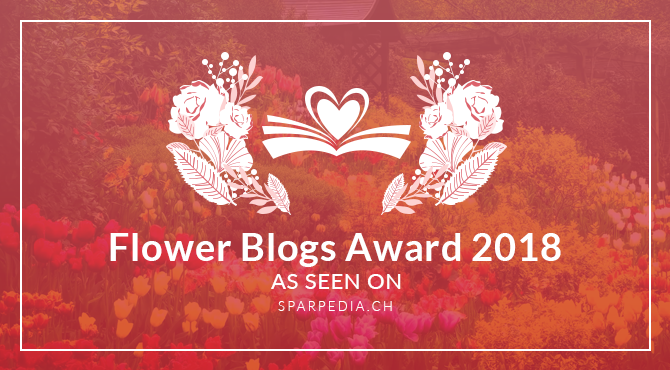 Some of which have kindly sent me some of their seeds to grow. As well as these dedicated growers and seedsavers, the Australian Government has a seed bank containing seeds of various vegetable and agricultural plants. 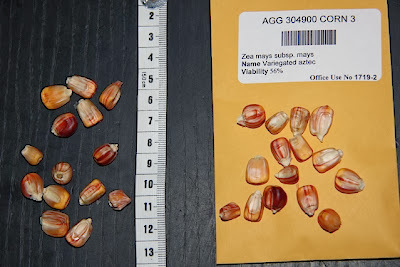 They occasionally distribute small amounts of this seed to researchers, plant breeders and very rarely people who are interested in maintaining a particular line. 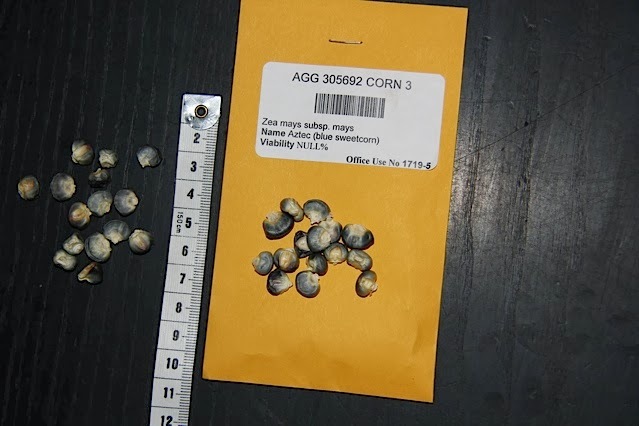 They impose a lot of strict rules regarding seeds when they do distribute them, I am lucky enough to have some of their corn seeds. 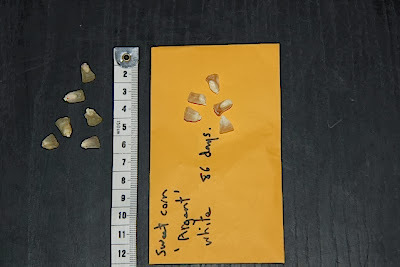 I am working on improving the Glass Bead corn by selecting for it to be a better popcorn. So far I have made a lot of ground in a short amount of time. 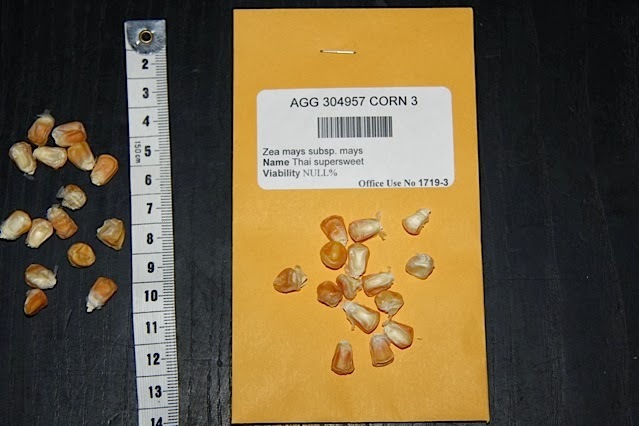 If all goes well I will continue this and end up with an improved strain of glass bead corn, if things go poorly I should be able to cross it with a different type of popcorn to incorporate some more of the "popping" genes. I also have dreams of breeding an improved blue sweet corn or blue super sweet corn. If it works this will take me a few years. I also have a few other plans, but do not want to say too much about them as I do not know how much time or space I will be able to put into any corn breeding projects so may not actually start them for a few years. Below are some pictures of some of the corn seeds that I currently have, I have included a tape measure so that you can see the size of the seeds, some are huge while others are tiny. 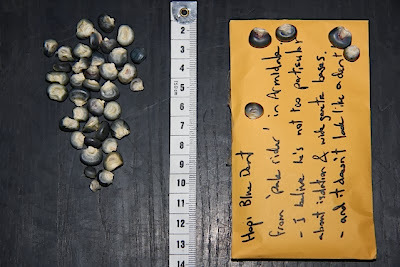 They have come from people who are preserving particular lines, people who are breeding new varieties, as well as from the Government seed bank. I also have a bunch of different yellow sweet corns and supersweet corns as well as bicolour sweet corn and supersweet corn but have not taken their pictures as they pretty much all look the same when they are seeds. At this stage I have too many to be able to grow them all each year, so only the best will make it through. Fingers crossed I will get a good crop out of Argent and be able to save seeds. 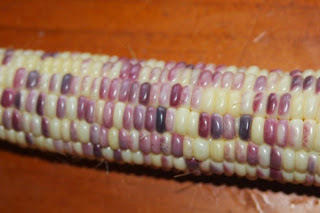 I really do love this variety of corn, I don't know why it is so difficult to find. Unfortunately I had a low germination rate from a low number of seeds so things are not looking good. 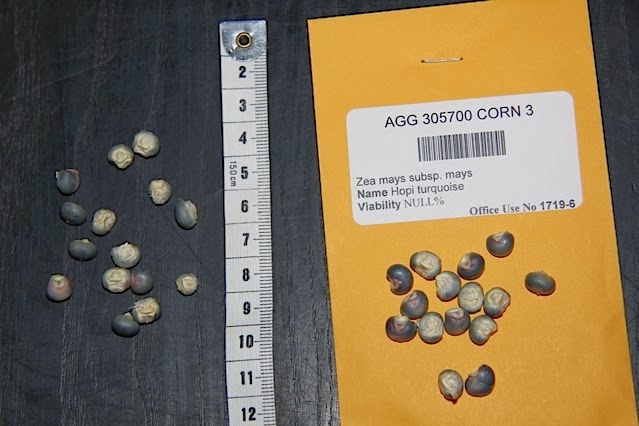 This is the glass bead corn that I have been working on. You can see clearly that it is a pop corn, what you can't see is that it is not a great popcorn yet. Hopefully a few years will fix that. It is very different from the two types of multi coloured Aztec corn above. It also has some genes that the other types do not appear to have. 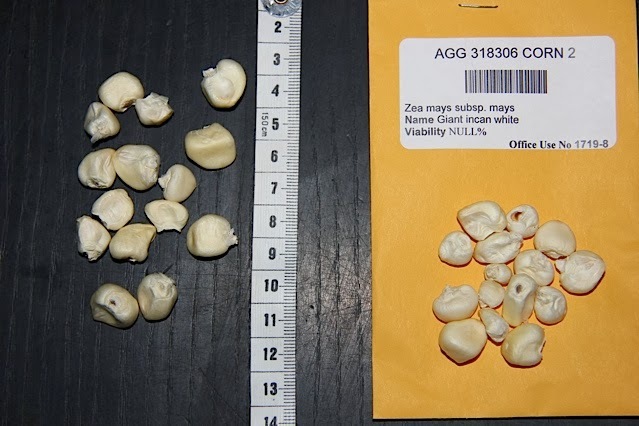 Where do you begin with Giant Incan White corn? So much potential. Each kernel is absolutely HUGE. To the best of my knowledge nowhere in Australia has this except for the government seed bank and they are not at all keen on distributing it to anyone for any reason. Unfortunately it is also extremely daylight sensitive so I do not know if it will grow where I live. I also do not know what "Viability NULL%" means. I hope it simply means that it has not been tested and will still germinate well for me. It has been planted and I am trying to be patient so only time will tell. I used to grow this when I was a kid. The cobs are small and look pretty good. 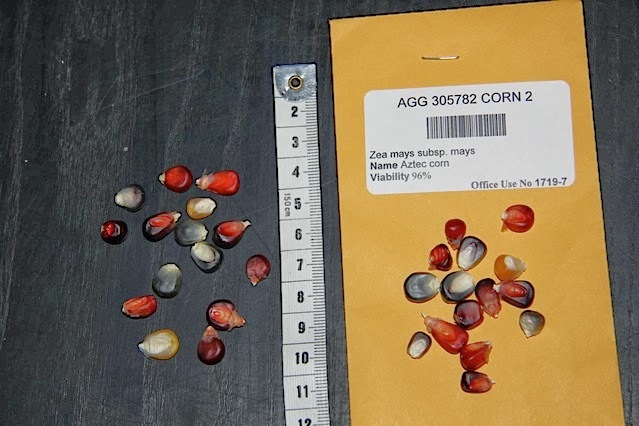 The seeds are tiny, compare this to the size of the Giant Incan White and then to a regular corn seed. From memory it produces half a dozen cobs per plant. Like all popcorn it pops white. It is fun for the kids to grow. 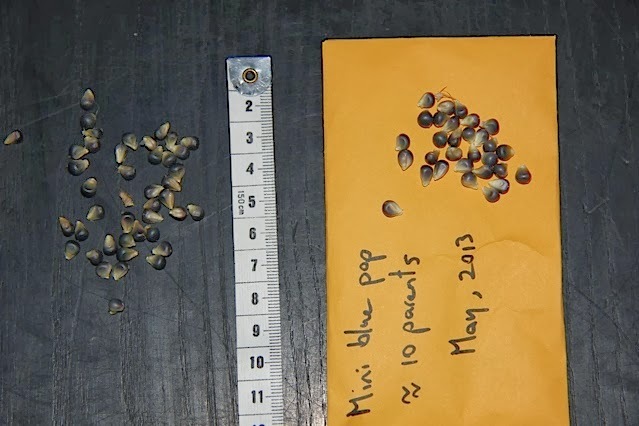 It may not seem normal to catalog seeds like this, but it should be useful in the future. As I start to improve varieties or create new varieties this will be useful to look back upon to see how far each one has come. I am glad that the government has a seed bank with things like this, I am also glad that they distribute it to researchers and breeders. 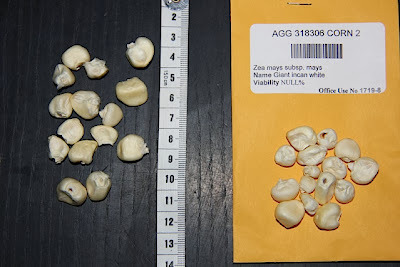 I am very lucky that I have been considered worthy of growing these seeds, especially the Giant Incan White corn. The only down sides that I can see are that they only give 30 seeds and you only get one shot at it, so I have all my eggs in one basket. If we have a late/early frost, locust, fire, flood, or anything else that causes crop failure then these seeds are gone and there is no way for me to ever have another try. 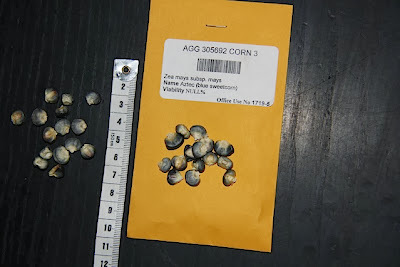 The only corn seeds I will be selling for the moment are the glass bead corn, hopefully I will be able to add some of the others at some stage. Everything that I sell is listed on the For Sale page if you are interested.